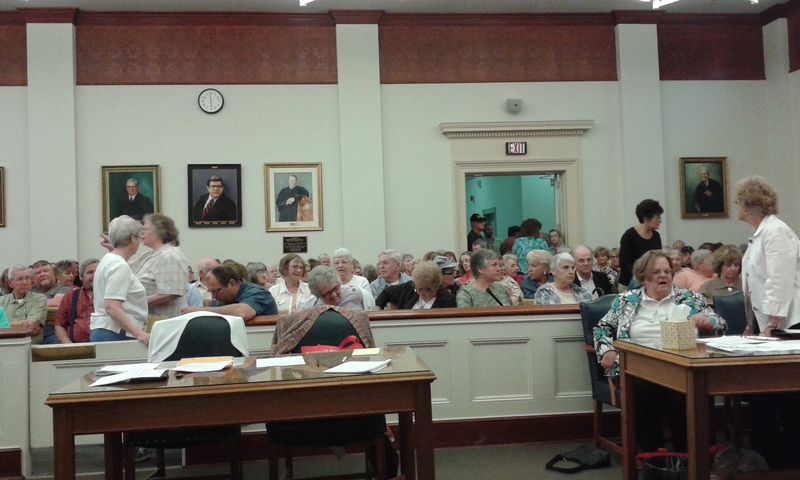 CLEARFIELD – A standing room only crowd of residents gathered at the Clearfield County Courthouse Wednesday to discuss the future of Penn Highlands Clearfield, formerly known as Clearfield Hospital. The meeting was called by members of the hospital auxiliary. 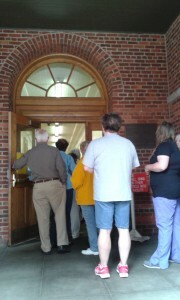 Before the meeting began, concerned residents wishing to enter the courthouse, lined up for nearly two blocks. 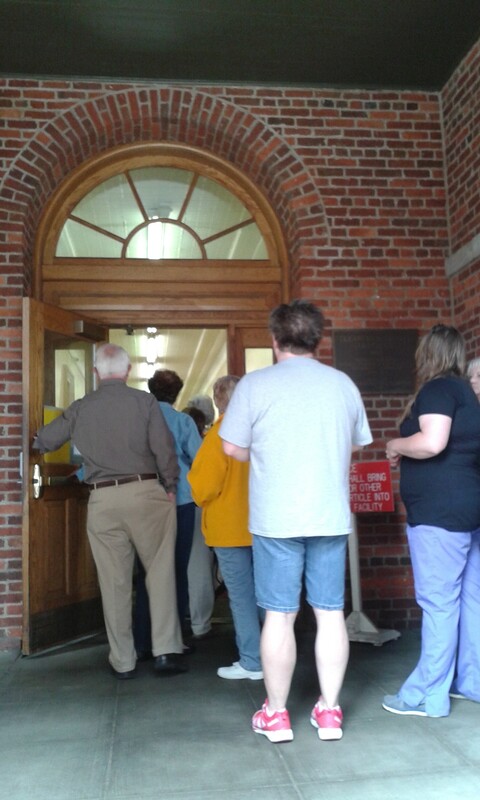 The crowd filled Courtroom 1 to capacity, spilled out into the hallway and into Courtroom 2. Some residents even sat on the floor, just to be able to hear what was being said. The meeting was opened by Bob Day, who was acting as master of ceremonies. Day welcomed everyone and thanked them for coming. He said the purpose of the meeting was to ask questions of the past decisions, make suggestions for future problems, to show the “domino effect” the decisions have had on the community and businesses and to see what lies ahead in the future plans for the hospital. First to speak was Jim Leitzinger, who gave a history of the hospital. Leitzinger said after World War II, numerous people got together to discuss the need for improved medical care in the area. Businesses owners, community leaders, civic groups and organizations, as well as individuals got together to raise money to build a hospital. He said over the next 65 years, people have donated to the hospital again and again to help with equipment upgrades, renovation and expansion projects. In 2007, he said the community came together yet again to build the Yingling Cancer Center. Speaking next, former Clearfield mayor and business owner Jim Moyer said he respects the hospital board members and understands that sometimes, tough decisions have to be made and people must accept change. He said healthcare throughout the nation is changing. However, Moyer said he feels a meeting like this should have been held four or five years ago. He said he did not understand why there were no public meetings held to keep the public informed. He said if the community had been made aware of how bad things are or were and what was going on, things wouldn’t have gotten as bad as they are. Moyer said when the merger took place it was supposed to be so everyone would benefit from it with cost-saving and bulk-buying. Clearfield County Commissioner Joan Robinson-McMillen noted that no one from Penn Highlands was at the meeting. She said with such a large turn-out, hopefully the community could get some answers. She said the community had a very close relationship with the hospital, and it was the sense of “community doctoring” that made the hospital special. Dr. Michael Dotsey said many of his patients are elderly and cannot make the drive over to DuBois, particularly in the winter. He said when talks about changes to the local healthcare providers started it was supposed to be an affiliation. It was not supposed to be a “take-over” or a “merger.’ The community, he said, was supposed to benefit from the ability to recruit doctors. Dotsey said he has a list of the doctors who have left within the past five years, but no comparable list of doctors who came. He said there is also a list of people who are going to be leaving in the immediate future. He said the maternity unit had one doctor to deliver babies. He said instead of having a doctor from one of the other Penn Highlands hospitals to come to Clearfield, Clearfield’s doctor is traveling to DuBois. Dotsey said Clearfield’s pathologist travels to DuBois when one of DuBois’ pathologists is on vacation, but when Clearfield’s pathologist is on vacation, no one comes to Clearfield. “That’s not coordinating services, that’s they get them, we don’t.” he said. Dotsey said it also limits what other doctors can do surgically, because they are being told they cannot perform certain procedures, which would require a pathologist, when Clearfield’s pathologist is unavailable. Dotsey than said that Dr. Doug Yingling, chief of surgery at Penn Highlands Clearfield was supposed to speak, but he was performing emergency surgery. Dotsey said the administration at the hospital is “doing everything it can” to stop surgeries after 5 p.m. in order to save costs. “It will save money but it will not save lives. It will not give you the chance to have emergency surgery in the middle of the night. What happens if a bleeder starts, what happens if something unexpected happens,” Dotsey said. Terry Wigfield, director of Clearfield Emergency Medical Services, said how the hospital system is being run effects EMS deeply. He said it used to be that an ambulance would take a patient to Clearfield Hospital and back out on the road immediately. He said more and more people are asking to be taken to DuBois because of the kind of care they get at Clearfield Hospital. He said the trip to DuBois takes at least an hour, even longer in bad weather. Also speaking at the meeting were Drs. Justin McCarthy, Praxidio Tagala and Carol Elkins, who discussed how the cutbacks, red tape and the push to discharge patients quickly have put the remaining doctors under a lot of strain. Elkins said while the doctors and hospitals are pushed by insurance companies to discharge patients quickly, they are penalized by those very same companies if a patient is readmitted for the same problem. Tagala said the doctors’ offices and hospital units are “downsized” to a bare minimum, which impacts the quality of patient care. McCartney said more and more doctors are leaving, particularly in the surgical areas. He said many were told the linkage with DuBois would help “weather the storm” by combining services and sending patients from Clearfield to DuBois, and patients from DuBois to Clearfield, but that is not happening. Also speaking at the meeting were Commissioners John Sobel and Mark McCracken and hospital board member Susan Mosch. During the public comment section, some residents asked why State Reps. Tommy Sankey and Matt Gabler and the area’s senators were not present. They were told that the legislature was still in session and the officials could not make it. A majority of the residents wanted to know why the community was not kept informed about the changes at the hospital and who they had to talk to in order to get some answers. Others asked if more services would be moving out of the area and if it would be possible to get some services back to Clearfield. Resident Sheri Cohen encouraged everyone who had attended the meeting to “inundate” the representatives and senators with letters asking for help and for answers. Another resident asked if there were some way to get out of the merger. Jim Gray, who had been on the Citizens Board, said there had been talk of a five-year window, where the hospital could reconsider the merger, but no one was sure when exactly this window began and when it would be done. 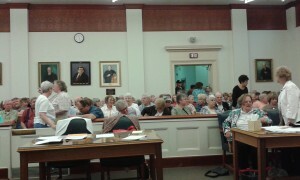 Residents also questioned the make-up of the hospital board itself and wanted to know if Clearfield could get more votes. There were suggestions of meeting with representatives and residents from the Brookville and St. Marys areas to discuss their opinions on the situation with Penn Highlands. Members of the hospital auxiliary said there will be a meeting with a group of representatives of Penn Highlands and all the questions and concerns from the meeting are being recorded and will be brought to the representatives. The information from that meeting will be disseminated to the public.